Description: UPRR Shreveport, LA to Chico, TX empty rock train RSHPH-07 heads up the UPRR Duncan Subdivision between Hicks and Newark - UP 2097, UP 1987, SSW 9642, UP 1916, 98 empty GTR and GTB rock gons, and ETD UPRQ 63502. Description: UP 2097 trails a local heading of the main onto a branchline at DeKalb, IL. 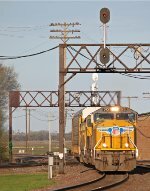 Description: UP 2097 trails a southbound local out of DeKalb, IL. Description: UP 2097 leads the Troy Grove job westbound at Maple Park, IL. Description: UP 2097 waits between assignments at UPs yard in Belvidere, IL.